Mastered from the original master tapes and pressed on 180g LPs at RTI, Mobile Fidelity’s numbered limited edition of this period-defining recording renders the stripped-down fare with immense detail, rich airiness, and reach-out-and-touch-it realism. Longtime Deadheads and newcomers alike will hear significantly more information, experience wider and deeper soundstages, and become swept away by incredible tonal and vocal balances—traits made possible by the format’s wider grooves. Instrumental melds and refined accents, such as guest David Nelson’s nimble fills on “Cumberland Blues,” are part of a larger whole that gives the impression you are witness to the world’s coziest campfire session. Frontier tales and refined performances further this feeling. The first Grateful Dead album to eschew cosmic jams and complex signatures, Workingman’s Dead stakes its existence to great songs, homespun warmth, and bare essentials. Its wistful, relaxed state—immediately apparent via the innocent album-opening invitation “Will you come with me?” on “Uncle John’s Band”—owes to the circumstances and conditions surrounding its creation. At the time, the Dead owed a considerable financial debt to Warner Bros. and were hobbled by a recent drug bust and financial scandal. Most significantly, the band was recovering from—and reacting to—the tragic events of the Altamont Music Festival and symbolic end of the peace and love era. As such, Workingman’s Dead acts as a retreat from chaos and uncertainty, its songs emblems of simpler times and pleas for compassion in the face of hardship. Lyricist Robert Hunter said he aimed to capture the vintage elements of late 1940s country-and-western jukebox singles as well as old blues classics. In that vein, fare such as the Bakersfield-leaning “Cumberland Blues,” pastoral ballad “Dire Wolf,” and bluesy “Easy Wind” hit the mark. Leader Jerry Garcia’s occasional pedal-steel underpinnings arrive as a bonus. 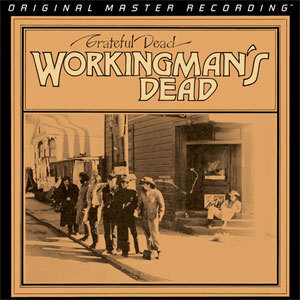 Of course, aside from the economical concision and thematic consistency, the genius of Workingman’s Dead resides in the group’s expressive harmonies. Taught by Crosby, Stills and Nash, the Dead produce live “air blends” of multi-part vocal harmonies that provide the foundations of nearly every track. “Uncle John’s Band,” “High Time,” “New Speedway Boogie” (with the iconic refrain “One way or another/This darkness has got to give” referencing the ill wind that greeted the new decade), and the radio favorite “Casey Jones” practically float on the ensemble’s communal vocal beds. Mobile Fidelity’s 45RPM edition renders these invigorating, refreshing, and engaging characteristics in three-dimensional sound that transports you to the event. Recordings don’t get more lifelike. Workingman’s Dead—an iconic, ageless record that drew countless listeners to the band’s unique style because of its accessibility and charm—deserves nothing less. Neither do you. GAIN 2 Ultra Analog™ is a proprietary cutting system built and designed by legendary design genius Tim De Paravicini, with consultation from one of MFSL’s founding fathers – Stan Ricker, an audio engineer responsible for many of MFSL’s most heralded past releases. First and foremost, we only utilize first generation original master recordings as source material for our releases. We then play back master tapes at half speed enabling the GAIN 2 Ultra Analog™ system to fully extract the master’s sonic information. Our lacquers are then plated in a specialized process that protects transients in the musical signal. (Due to this process, there may be occasional pops or ticks inherent in initial play back, but as the disc is played more, a high quality stylus will actually polish the grooves and improve the sound). We further ensure optimum sound quality by strictly limiting the number of pressings printed for each release. These limited editions, in addition to being collectors’ items, ensure that the quality of the last pressing matches the quality of the first. As you can imagine, all these efforts involve a tremendous amount of time, technology, cost and effort. The introduction of GAIN 2 Ultra Analog™ maintains Mobile Fidelity Sound Lab’s position as the world’s leading audiophile record label, where a passion for music with extraordinary sound quality matters most. Record Technology is a world class record pressing plant located in Camarillo, California. We have been operating since 1974, pressing for most audiophile record labels and for many quality minded independent and major record labels from around the world.